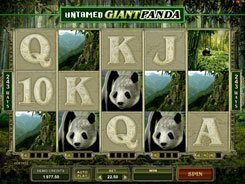 Microgaming brings you this animal life-themed slot with five reels and 100 fixed lines. Before any spin you can adjust the settings to the amount you want to bet. A coin value has two options ($0.01 and $0.02), whilst the number of coins per spin can be altered in a range from 1 to 5. Thus, the floor and ceiling bets amount to $1 and $10. 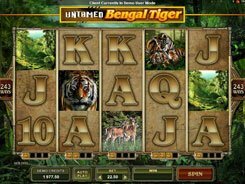 Along with orthodox playing card symbols, the game features safari-themed icons like lions, zebras, cubs and antelopes. The biggest payer in the game is a wild depicted by the Lion’s Pride logo. 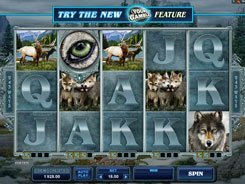 Get five wilds on any payline, and take away 1250 coins or $12500 if playing at max. 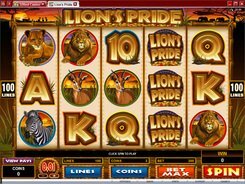 The second-largest win of 1000 coins is paid out for a Lion symbol, once these five hit an active payline. 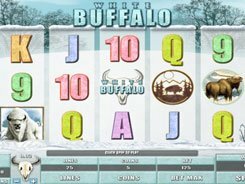 Three, four of five Mask symbols scattered across the reels activate 25 free spins with a x2, x3, x5 or x10 multiplier that is randomly awarded every free spin. Furthermore, scatters pay out up to x100 times a total bet if at least two occur in any position. 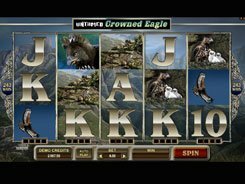 Finally, the slot offers a gamble feature that can be optionally activated after a winning spin. PLAY FOR REAL MONEY!